Auto Racers for Kids presents Bingo for Kids, Saturday, April 14th at the Mill Village Fire Hall. Tickets are available by calling Rhonda or Jim at 814-746-2047 or 746-2048. Doors open at 4PM, Bingo starts at 6. All proceeds benefit 2018 receiving charities: 2nd Harvest Food Bank School Back Pack program, EUMA’s The Refuge, Erie Dawn and The Trinity Center. We look forward to you sharing the fun and helping children in need in our community. On Wednesday, October 11th 2017, Auto Racers for Kids presented 4 local charities checks that will benefit children in need. 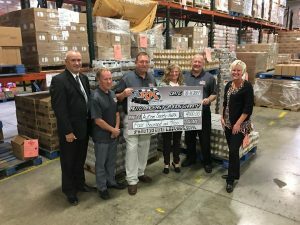 Because of the generosity of the racing, business, classic car and our community of giving fans, Auto Racers for Kids was able to donate $13,000.00 to The Second Harvest Food Bank of NWPA to help fund the Back Pack program at Tracy Elementary School. Many children get their only nutrition of the day when at school and many have little or nothing to eat on the weekends. This program helps fill the gap between Friday and Monday. Many of the children’s siblings benefit from this also. Also benefitting was The Refuge operated by The Erie United Methodist Alliance with a check for $15,000.00. The Refuge is a place where homeless families can stay until employment can be found for the parents and permanent housing can be arranged. Due to changes in State and Federal housing laws, The Refuge now depends solely on private donations. Food and shelter are basic necessities of life for these at risk children and Auto Racers for Kids strongly supports the work of The Refuge and Second Harvest Food Bank of NWPA. Auto Racers for Kids has been the title sponsor of The Autism Society of NWPA’s Lego Social Program since its inception four years ago. It began with just a few children and now has grown to 53 kids ranging from Kindergarten to 10th grade. Legos, and the programs created by The Autism Society of NWPA, have greatly enhanced the social and participation skills of children with Autism. We were thrilled to present them with a check for $4,000.00. Earlier this year a couple of our board members became aware of a charity that finds children in need of sponsorship to receive Christmas gifts. Project Secret Santa is a part of the Community of Caring charity in Erie and Auto Racers for Kids couldn’t resist helping out to make sure even more kids who might otherwise go without a Christmas gift, will now receive one. It was our pleasure to present the Community of Caring’s Project Secret Santa with a check for $2500.00. This year’s donations to these wonderful and deserving charities totaled $34,500.00. 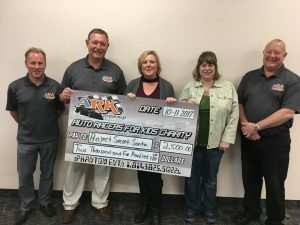 Since Auto Racers for Kids was formed in 2008, we have raised and donated more than $320,000.00 to charities that focus on children in need in Erie and Crawford counties. Many thanks once again to our committed board members: Scott Bonnell, Jeff Plyler, Jill DiMattio, Kathy Rohrer, Mike Langer, Brandon Groters, Jim and Rhonda Eggleston and Laurie Woolslayer. And especially in memory of a board member and dear friend we lost this year, Bob Rohrer. Thanks to all who participated in our events and made donations. Please know you have definitely made a difference in the life of a child in need. We hope 2018 will be another great year, so check back here from time to time and remember to like us on Facebook at www.facebook.com/autoracersforkids to get information on our 2018 events.